This is Flower 2 in my paper flower series. If you haven’t seen Flower 1, click here. Flower 2 is similar to a dahlia. It will be very easy to make, but does require a lot of petals. However, I think the work is worth it as a large dahlia on a backdrop looks really pretty. 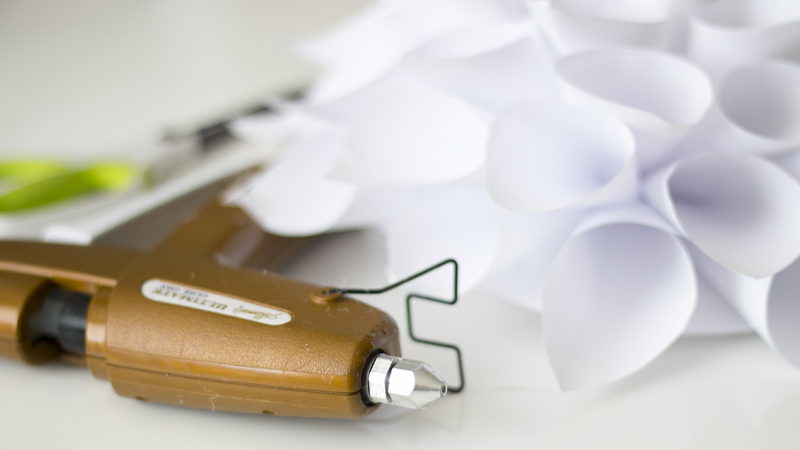 As the same as the previous tutorial, you’ll need some paper, a glue gun and scissors. You can use any type of paper. I just used regular copy/printing paper because I wanted to use paper I already had on hand. But if you prefer written instructions, I have that too! First you will need square pieces of paper, the number depends on how large you want your flower. For my size, I ended up using 37 squares. They do not have to be perfectly square. I just folded a piece of copy paper diagonally, cut off the excess, and cut that square into 4 smaller pieces. You also need 1 circle that will be the backing for your flower, and it will determine the size of your flower. The flower will end up being about 2 inches beyond your circle. You should try to use a heavier paper for the circle to give your flower some support, but if you don’t have any, I made mine with regular paper and it worked out fine. Starting with 1 square, choose a corner and roll it towards the center, apply some glue, and glue the opposing corner on top, so that you create a cone with a wide open top and a pointy end at the bottom. Make several of these, and then you can move on to the next step. You’ll have to make more cones as you go. Flatten the pointy end of your cone, and glue it to the circle with the open top going past the circle’s edge. Try to space out the cones evenly, so there is some space between them, but not enough for another cone to fit in. Once the circle has been filled, that is your first layer. Make more cones, and start gluing these in the space between the bottom cones, gluing from the center. These cones should not go past the bottom layer of cones. Continue making layers of cones like this, until there is no space left. As you make more layers, you will find that your cones are getting too long, so you will need to cut off some of the pointy end. The number of layers will be determined by the circle’s size as well. Mine had 4 layers and 1 center cone. For the final cone, you can leave the cone as-is, or you can cut off the top so that it is even and circular. 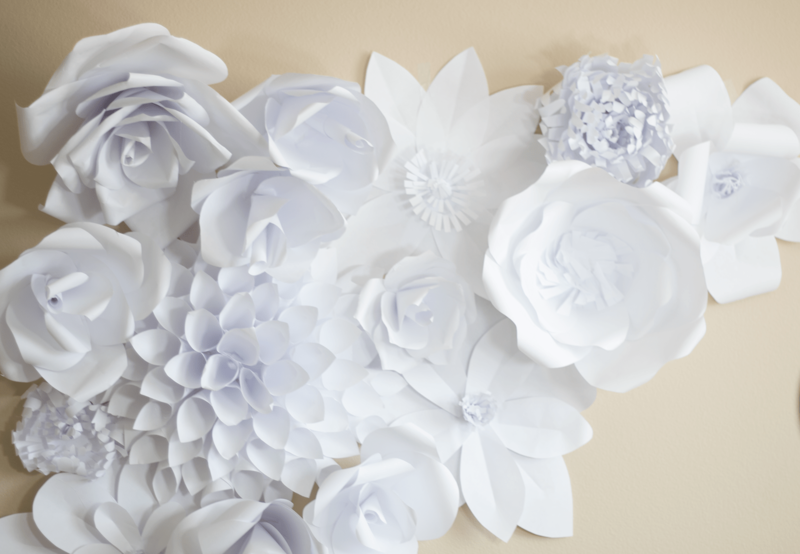 Now you can add it to your growing paper backdrop! My next tutorial will be on large, easy flowers that can be used as fillers. Thanks for reading! Oh my, this is stunning! I am definitely pinning (: Visiting from http://www.andieconn.com/free-printables-st-patricks-day/ and would love a visit back! Hi Cathy! Thank you so much for your kind comments and thank you for hosting the link party! Thank you for stopping by Tammy! I love how this flower is coming out. And I love the monochromatic colorscheme. Indeed perfect for not-too-invasive wall art or photo backdrop! These flowers are gorgeous, I love the step by step video – that’s my favorite way to learn how to create things. Thanks for linking up to the Bloggers Brags Pinterest Party. I have pinned your post to the Bloggers Brags Pinterest Board. Thank you so much Janine and thank you for pinning my post! Thank you so much! I will definitely see you on Monday! Thanks for hosting! I love this! I want to make a 6ft x 8ft wall for my wedding. I know it will take me a while but I have 1 year to do it! What material do you recommend I use to glue the flowers on? I was thinking maybe two or three large art canvas pieces and connect them all together but that’s where I get stuck. I’m not sure how I could connect the pieces and how would I make it stand straight. Any advice? These are awesome !! when will you have Flower 3 tutorial ?? so looking forward to it !! Thank you oh so much for this wonderful website. I am bless to have found you today. I will be using your videos to create some beautiful flowers for my sisters first communion next weekend. Thank You and God Bless you Ash. Absolutely STUNNING. Love them all. I’m making centerpieces & a wall. Would love to know when will you have Flower 3 tutorial ?? so looking forward to it !! These are BEAUTIFUL!! Do you know when will you have Flower 3 tutorial ?? Just LOVE your stuff!! !